(Canadian, b. 1979) Based in London and New York, Melanie Gilligan works in a number of different media, including video, performance and installation. Her dramatic film work reflects disturbing and sombre dystopian worlds; they are produced with the smooth conventionality of TV serials and a keen eye to contemporary media, technology and political economy. Gilligan graduated with a BFA from London’s Central Saint Martins in 2002, and from 2004 to 2005 she was a fellow with the Whitney Museum of American Art’s Independent Study Program. Gilligan works across media and is prolific as a writer and teacher. Her critical writing appears in publications such as Artforum and Texte zur Kunst, although Gilligan is best known for her foreboding video works Crisis in the Credit System (2008) (a four-part fictional mini-drama about the recent financial crisis commissioned by Artangel Interactive), Self-Capital (2009), and Popular Unrest (2010). Gilligan’s recent work, The Common Sense (2015), takes the form of a science fiction mini-series which looks at how minds, bodies and interpersonal relations are shaped by technological advancements within capitalism. Though much of her work is freely viewable online, it has also appeared in group exhibitions at venues such as Tate Britain and Manifesta 8, and in solo exhibitions at the Banff Centre, Presentation House Gallery, North Vancouver, the Justina M. Barnicke Gallery, Toronto, Chisenhale Gallery, London and the Kölnischer Kunstverein, Cologne. Honours include the 2009 Paul Hamlyn Award for Artists and the 2010 Illy Present-Future Award. Goldin+Senneby is the framework for collaboration between Swedish artists Simon Goldin and Jakob Senneby. Since 2004, Goldin+Senneby have initiated projects that explore juridical, financial and spatial constructs through notions of the performative and the virtual. Through actions and theoretical pursuits, they interrogate the mythologies created by virtual economies and fictional personae. In their recent body of work, Headless (2007-), they approach the sphere of offshore finance and its production of virtual space through legal code. Since 2010 their work has focused on The Nordenskiöld Model, an experiment in theatrical finance, in which they attempt to reenact the anarcho-alchemical scheme of eighteenth-century alchemist August Nordenskiöld on the financial markets of today. Goldin+Senneby’s current project, “M&A” (Mergers and Acquisitions), uses the exhibition infrastructure as lab­oratory for developing algorithmic trading models. Mirroring the design of the algorithm intended to detect activity in the stock market that indicates early stages of possible mergers and acquisitions, Goldin+Senneby combine the speculative nature of both theatre and finance and the precarious labour conditions that characterize late capitalism. Jakob Senneby and Simon Goldin received MFA degrees from Stockholm’s Royal University College of Fine Arts in 2004 and 2007, respectively. In parallel with his artistic work, Goldin has studied management at the Stockholm School of Economics. Recent solo exhibitions include Tensta Konsthall, Stockholm (2013), Artspace NZ, Auckland (2013), NAK, Aachen (2012), Kadist, Paris (2010) and The Power Plant, Toronto (2008). 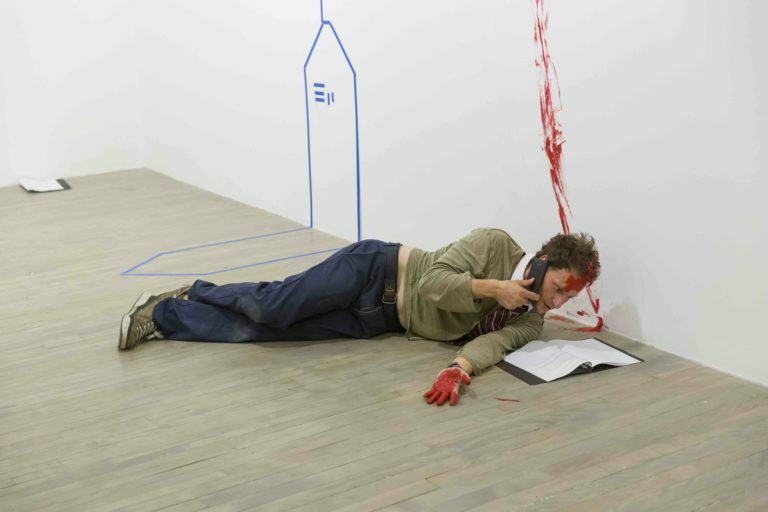 Group exhibitions include Tate Liverpool (2013), 13th Istanbul Biennial (2013) and Witte de With, Rotterdam (2011). Residencies include: Headlands, San Francisco (2012); SALT, Istanbul (2012); Kadist, Paris (2010); Gasworks, London (2008); IASPIS, Stockholm (2007). (Canadian, b. 1979) Gabrielle L’Hirondelle Hill is a Vancouver-based Metis artist who works in drawing, sculpture and public installation to inquire into concepts of history and place. Using surplus materials from illicit economies, such as the bright plastic insulation stripped from copper wire, Hill constructs delicately composed works with an attention to form, negative space and surface. Balancing their beauty is an attention to the use value of the objects and materials, summoning up the personal and social histories they imply. Bundled like caches, woven, propped and provisionally fastened, the sculptures evoke the conflicted and contested ways that the spaces of the city are claimed and used. Hill’s work questions how ideas of private property, trespassing, and Indigenous land rights shape urban space – and our experience of it – in ways that counteract dominant narratives of the city as a settled and cohesive whole. Using the surplus or waste from the unauthorized and furtive economies of the city’s marginal spaces, Hill’s work compounds our understanding of the market and its effects. Hill holds a BA with honors in English and a BFA in Visual Arts from Simon Fraser University. Hill is currently pursuing an MA at California College of the Arts in San Francisco. Along with Sophie McCall, Hill edited The Land We Are: Artists unsettle the politics of reconciliation (Winnipeg: ARP Books, 2015). Hill’s work has been exhibited at Sunset Terrace, Gallery Gachet, Grunt Gallery and Red Gate, Vancouver, TRU Gallery, Kamloops and Get This! Gallery, Atlanta. Based in Montreal and Durham-Sud, Quebec, Richard Ibghy & Marilou Lemmens work at the intersection of visual and performance art. Spanning across multiple media, their practice explores the material, affective and sensory dimensions of experience that cannot be fully translated into signs or systems. This investigation is fuelled by a critique of the rationale upon which economic actions are described and represented, and how the logic of economy has come to infiltrate the most intimate aspects of life. Their art practice investigates the ways in which the economic sciences and the theories of management represent the world. The notion of work, seen through the lens of its recent transformations, is central to Ibghy & Lemmens’ approach, as it embodies what Michel Foucault defined as biopower; that is, the capacity of economic thought to control, direct and orient the life of human beings. Most recently, their work has been shown at the 14th Istanbul Biennial (2015), La Biennale de Montréal (2014), 27th Images Festival, Toronto (2014), Quebec City Biennial (2014), Scène Nationale, Mulhouse, France (2013), Henie Onstad Kunstsenter, Høvikodden, Norway (2013), Centre for Contemporary Arts, Glasgow (2012) and the 10th Sharjah Biennial (2011). Recent solo exhibitions include Leonard & Bina Ellen Art Gallery and VOX-Centre de l’image contemporaine, Montreal (2014), Trinity Square Video, Toronto (2014), La Bande Video, Quebec (2014) and Monte Vista Projects, Los Angeles (2012). Their writings have been published in Le Merle, C-magazine, New Social Inquiry, and Pyramid Power. They have published two artist’s books Tools that Measure the Intensity of Passionate Interests (2012) and Spaces of Observation (2012). Based in New Delhi, the Raqs Media Collective (pronounced rux) was formed in 1992 by Jeebesh Bagchi (Indian, b. 1965), Monica Narula (Indian, b. 1969) and Shuddhabrata Sengupta (Indian, b. 1968) after the three graduated from Mass Communications Research Centre at the Maia Milia Islamia University, Delhi. Artists, media practitioners, researchers, editors, catalysts of cultural processes and most recently curators of the 11th Shanghai Biennale (2016), their work takes the form of installations, performances, online interventions, objects and encounters. The collective plays a plurality of roles, often appearing as artists, occasionally as curators and sometimes as philosophical agent provocateurs. They have worked with architects, scholars, coders, writers, designers, translators, performers, artists, curators and theatre directors, and founded processes that have become an influential force in contemporary intellectual and cultural life. Raqs remains closely involved with the Sarai program at the Centre for the Study of Developing Societies (www.sarai.net), an initiative they co-founded in 2000. Exhibitions include solo shows at the Isabella Stewart Gardner Museum, Boston, (2012), BALTIC Centre for Contemporary Art, Gateshead, UK (2010), Tate Britain, London (2009), Asia Art Archive, Hong Kong (2009) and Palais des Beaux Arts, Brussels (2004). The group curated Sarai Reader 09: The Exhibition (2012, Devi Art Foundation, New Delhi) and co-curated Manifesta 7 (2008, Bolzano, Italy). Works by Raqs are part of several contemporary art collections and museums. Lorna Brown is Acting Director/Curator at the Morris and Helen Belkin Art Gallery and a visual artist, writer, educator and editor. She has exhibited her work internationally since 1984. Brown was the Director/Curator of Artspeak Gallery from 1999 to 2004 and is a founding member of Other Sights for Artists’ Projects, a collective of artists, architects and curators presenting projects that consider the varying conditions of public places and public life. She has taught at Emily Carr University of Art and Design and Simon Fraser University. Her recent curatorial projects include Digital Natives and Institutions by Artists. Brown received an honorary doctorate of letters from Emily Carr University of Art and Design in 2015, the Vancouver Institute for the Visual Arts Award (1996) and the Canada Council Paris Studio Award (2000). Her work is in the collections of the Belkin, the National Gallery of Canada, the BC Arts Council, the Surrey Art Gallery and the Canada Council Art Bank. Gilligan’s The Common Sense takes the form of a science fiction mini-series looking at how minds, bodies and interpersonal relations are shaped by technological advancements within capitalism. This experimental narrative drama tells a story that revolves around a future technology that allows one to directly experience another person’s bodily sensations and affect. In Waste Lands, Hill uses surplus materials from illicit economies, such as the bright plastic insulation stripped from copper wire, gleaned as she walked the False Creek Flats in Vancouver. Her work questions how ideas of private property, trespassing and Indigenous land rights shape urban space – and our experience of it – in ways that counteract dominant narratives of the city as a settled and cohesive whole. 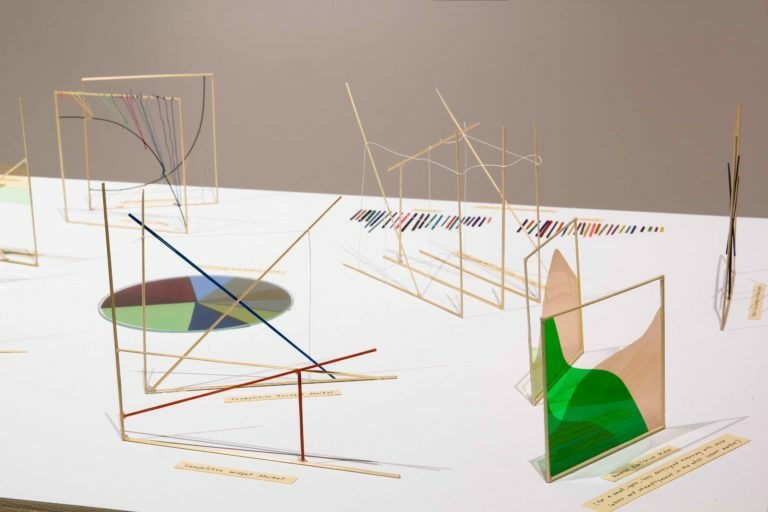 Ibghy & Lemmens’ The Prophets is a collection of 500 delicate hand-made models that represent concrete data and mental abstractions, law-curves and fact-curves, positions drawn in logical time and in historical time, as well as a number of other forms and procedures common to economic analyses. 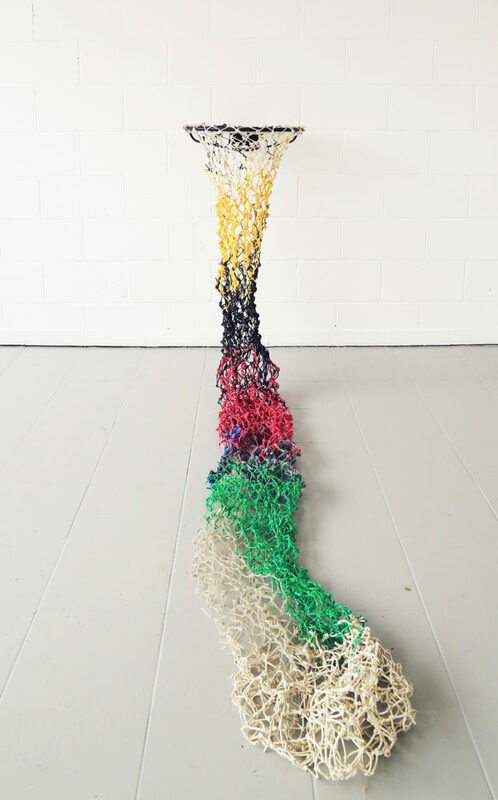 Together the sculptures made from everyday materials constitute a diagrammatology of economic thought. 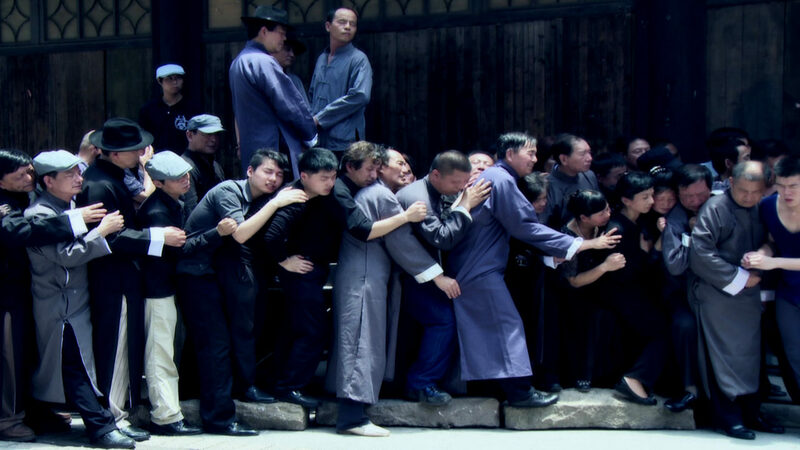 Raqs Media Collective’s video installation Re-Run features a crowd desperate to withdraw their money in anticipation of an imminent collapse of the value of currency in the lead up to the takeover of Shanghai by the People’s Liberation Army. Based on Henri Cartier-Bresson’s photograph from 1948, the video loop resonates with current geopolitical conditions. In a newly commissioned banner to be installed at height on the Belkin Gallery exterior, Nicolson reworks the British Columbia provincial flag, repositioning and inverting the Union Jack below a setting/rising sun recreated with a Pacific Northwest Coast Indigenous aesthetic, referencing the flag’s original orientation (1895-1906). While the original version of the flag with the sun atop the Union Jack suggested a cooperative situation and mutually beneficial alliances between the crown and Indigenous nations, the 1906 reversal symbolically revealed a relationship of oppression, theft and genocide. By righting the symbols of the flag back to their original relationship, Nicolson’s banner symbolizes the hope for and assertion of Indigenous rights over the land, which today remain largely unresolved. Concurrent to the exhibition, Nicolson’s paintings Tunics of the Changing Tide will be presented at the UBC Walter C. Koerner Library. In M&A, Goldin+Senneby collaborated with an investment banker and a computer scientist to develop a complex algorithmic trading model that locates indicators of pending mergers and acquisitions (M&A). The production budget for the project is invested in the stock market using this algorithm. If and when the invested money runs out, the actor contracted to perform ceases his endless rehearsal of the script. Goldin+Senneby combine the speculative nature of both theatre and finance and the precarious labour conditions that characterize late capitalism. M&A is a durational performance in the Print Gallery of the Belkin, beginning January 13 and running until the trading budget runs out. Goldin+Senneby, M&A, 2013. Exhibition view, La Biennale de Montréal, SBC Galerie d’art contemporain, Montréal, 2014. Gabrielle Hill, Tidal Economies, 2014, basketball hoop and plastic wire casings. Richard Ibghy & Marilou Lemmens, The Prophets (detail), 2013-15, mixed media. Produced in collaboration with Henie Onstad Kunstsenter. Raqs Media Collective, Re-Run (still), 2013, video. To refuse/To wait/To sleep and M&A are made possible with the generous support of the Audain Foundation, the British Columbia Arts Council, the Canada Council for the Arts and our Belkin Curator’s Forum members: Audain Foundation, Christopher Foundation, Nicola Flossbach, Henning and Brigitte Freybe, Jane Irwin and Ross Hill, Michael O’Brian Family Foundation, Phil Lind Foundation, and Scott Watson and Hassan El Sherbiny. Goldin+Senneby’s residency at UBC is supported by the Peter Wall Institute for Advanced Studies at the University of British Columbia. A publication that documents the presentation of To refuse/To wait/To sleep and M&A beginning on January 12, 2017, and continuing until complete. Works by Melanie Gilligan, Goldin+Senneby, Gabrielle Hill, Richard Ibghy & Marilou Lemmens, Marianne Nicolson and Raqs Media Collective are featured in an essay by curator Lorna Brown; Jamie Hilder contributes an essay about KP Brehmer; and Maria Lind’s conversation with Goldin+Senneby is offered in the form of a libretto by Pamela Carter. 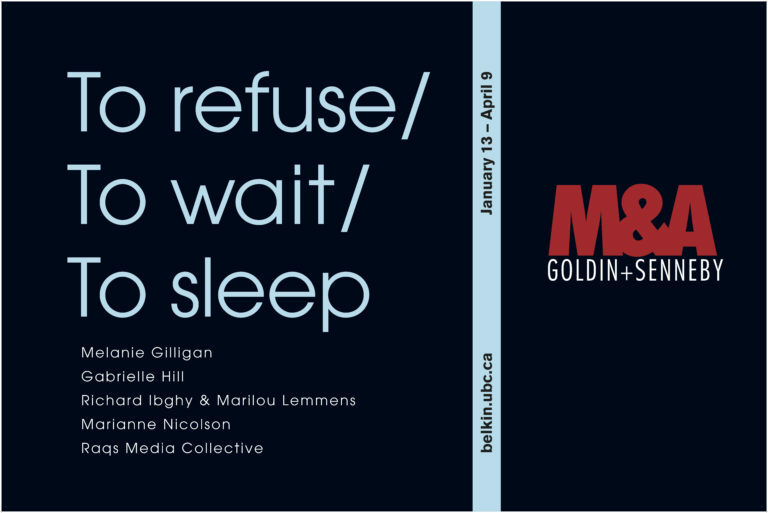 We are excited to welcome the UBC Contemporary Players back to the Belkin Art Gallery for a concert inspired by the exhibitions To refuse/To wait/To sleep and M&A. The program will showcase original compositions written specifically for the ensemble by UBC composers, as well as a new improvised work developed through workshops with visiting artist Douglas Finch. Led by directors Corey Hamm and Paolo Bortolussi with coaching support from Laine Longton, this graduate and undergraduate music ensemble from the UBC School of music will animate the Gallery for an afternoon program exploring themes from the exhibition including a range of affective expressions of late capitalism. This symposium is occasioned by the To refuse/To wait/To sleep and M&A exhibitions at the Morris and Helen Belkin Art Gallery. The paradoxical nature of money means that it has long been of interest to artists. Money’s tense and ever-changing relationship with the spiritual and material worlds are echoed in the visual arts - both money and art seem to have the capacity to conjure substance and value out of nothing. Although the relationship between the visual or performance arts and money is an old one, it is only relatively recently that artists have produced works that seek in some way to emulate or model economic practices. Both visual and performance artists are increasingly using their work to explicitly reflect upon the economic conditions in which it is being created. This has intensified in recent years as contemporary art has become ever more closely associated with high finance, appearing more and more as a global industry in its own right.